Dark green leafy vegetables are, calorie for calorie, perhaps the most concentrated source of nutrition of any food. They are a rich source of minerals (including iron, calcium, potassium, and magnesium) and vitamins, including vitamins K, C,E, and many of the B vitamins. 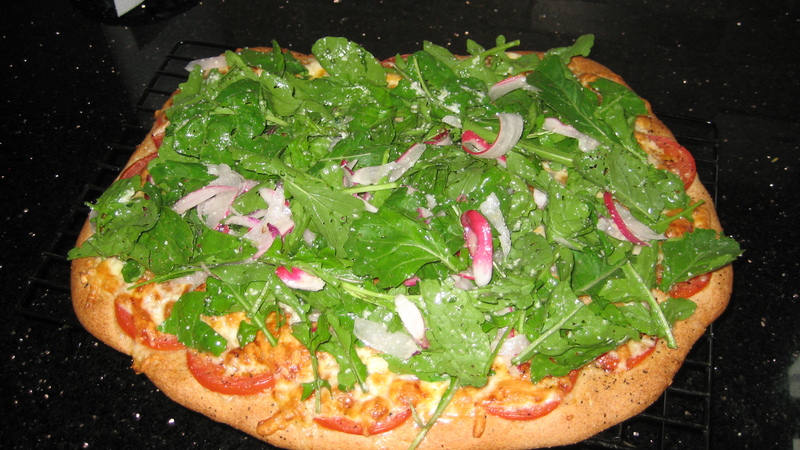 This Arugula Pizza is rustic and fresh. It’s become a summertime favorite. 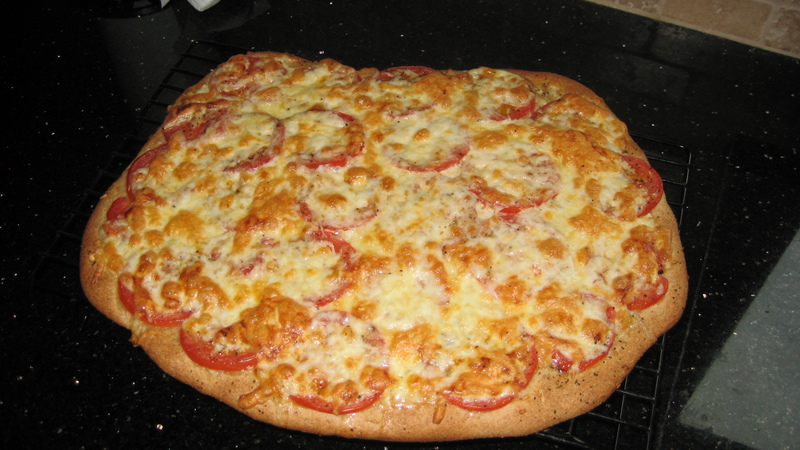 The following whole wheat pizza crust has been served to non- whole wheat lovers and enjoyed for it’s flavor. A side note for efficiency sake; I recommend 4 x-ing this recipe and then freezing it in small disks wrapped in seran wrap and place 2-3 disks in a gallon freezer zip-loc. to combine. If you are making this by hand, combine ingredients in a medium sized bowl and give it a quick stir with a fork. The mixture should foam a bit after about 5-10 minutes if it doesn’t it could mean the yeast is old. After the yeast mixture foams, add salt and slowly add flours all the while the mixer is doing the job of combining ingredients. 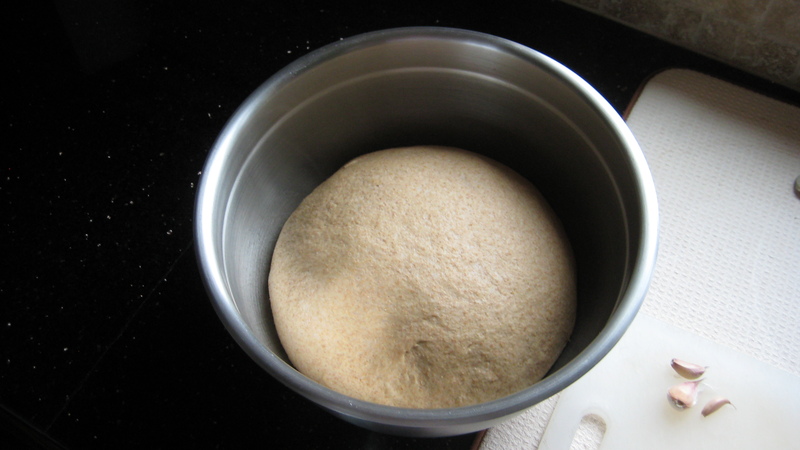 You have added enough flour when dough pulls away from the sides of the mixer and forms a ball. Mix on medium speed for 10 minutes. 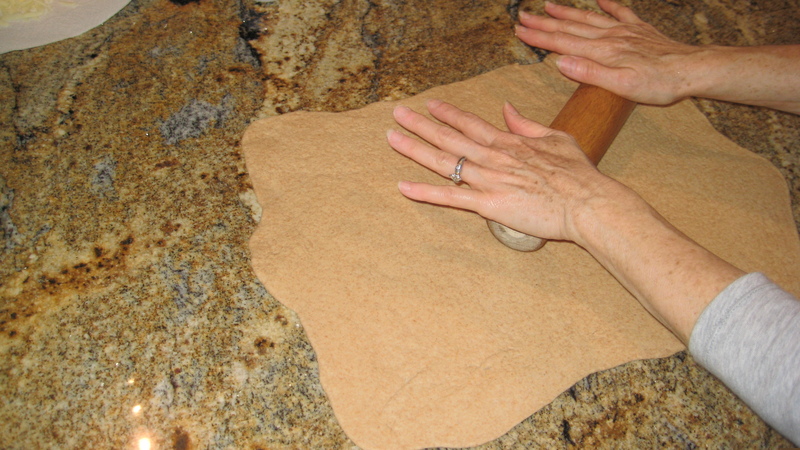 If you are making this by hand you will use a wooden spoon initially until dough is too stiff to stir. Transfer dough to a floured surface, continue to knead in flour until dough no longer sticks to the surface and feels soft. Knead for 10 minutes until the dough is smooth and soft. 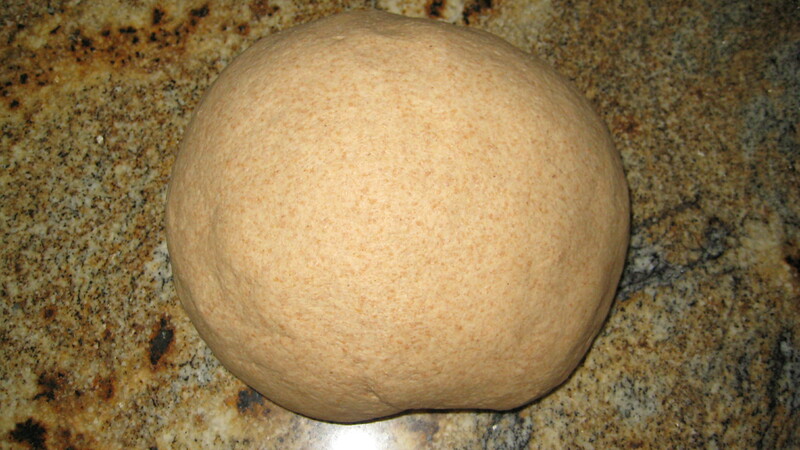 Form dough into a ball and place in a large deep bowl that you rubbed with olive oil. Turn the dough in the bowl to coat with oil. You want the dough to have room to grow so make sure your bowl is big enough. Cover with plastic wrap. 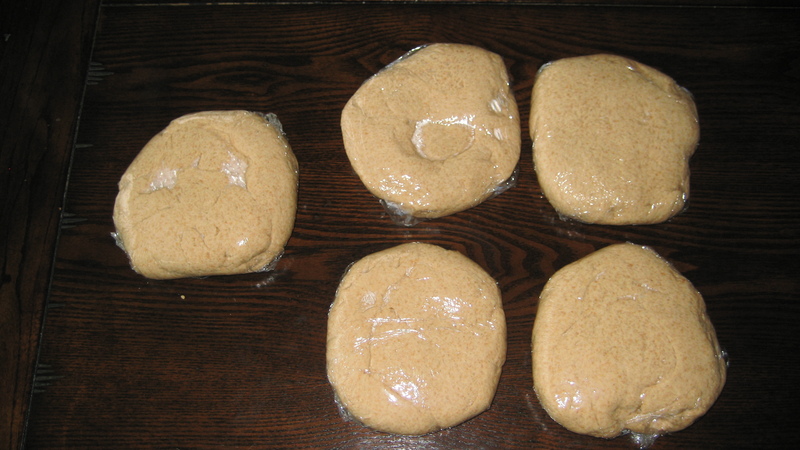 Allow dough to rise in a warm place for an hour. Punch dough down. 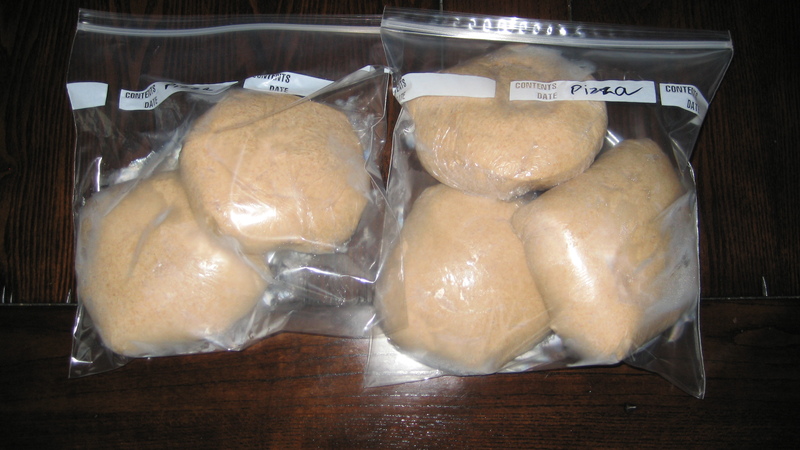 (If desired, at this point, you can freeze your dough, shape in flat disks, wrapped loosely in plastic). Preheat oven to 450 with a pizza stone on the middle shelf. If you have a convection oven, that is ideal, but not necessary. My pizza stone is 13 x 9 so I roll the dough into a rectangle that size and about 1/8 to 1/4 inch thick. (True authentic pizza makers make magic, stretching the dough with their hands and recommend not rolling the dough). 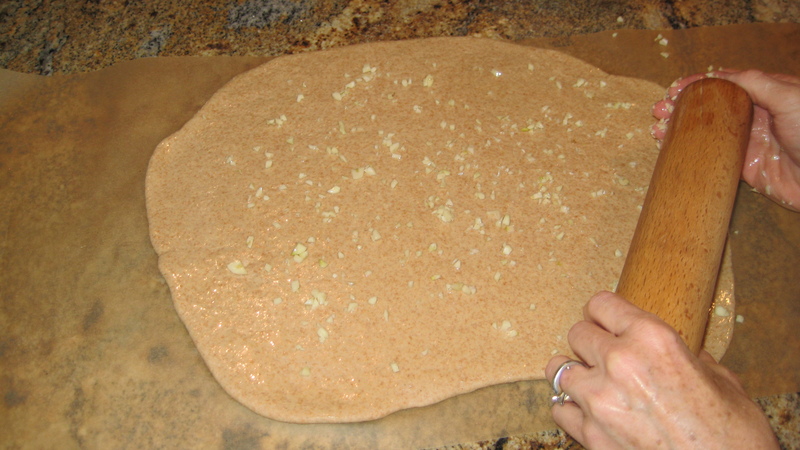 Before putting the topping on, I transfer the rolled crust to parchment paper. The pizza masters also use a pizza peel but in my kitchen parchment paper will have to do. 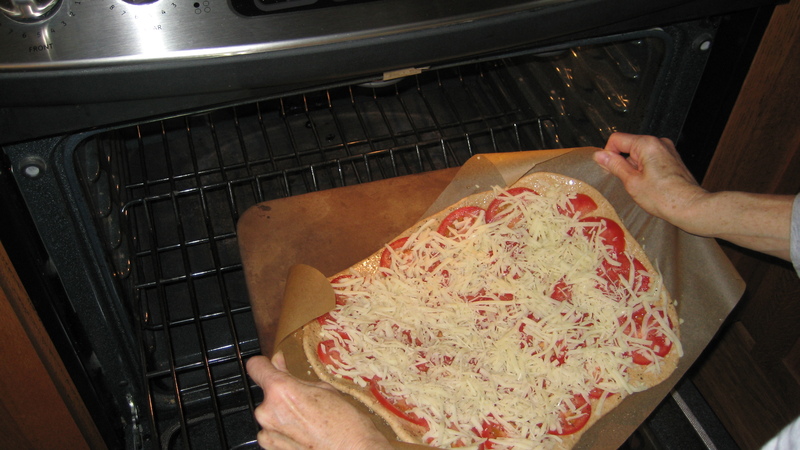 Place pizza in oven with parchment paper on stone. I actually use the parchment to carry the pizza into the oven. 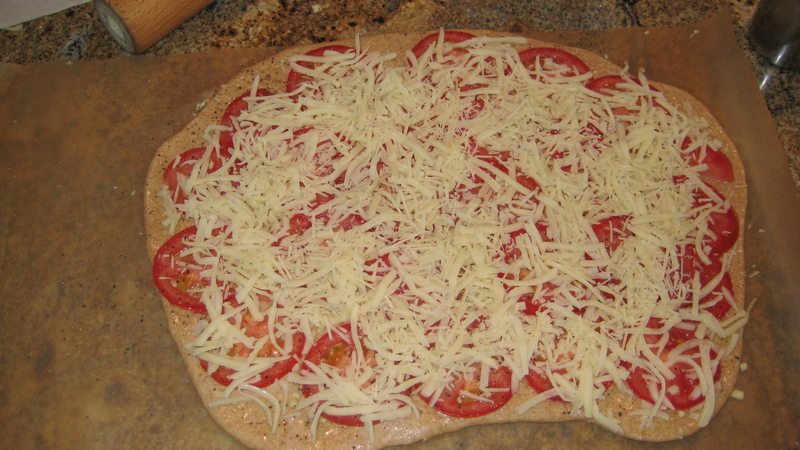 Bake for 15 minutes or until the crust is browned and the cheese is golden. 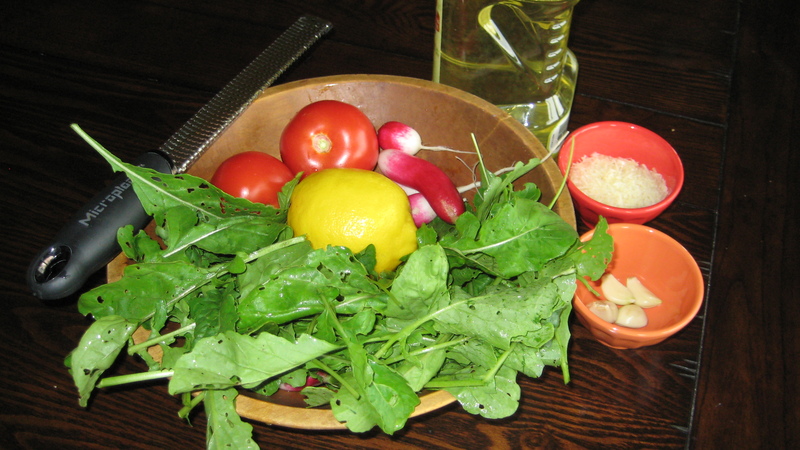 While the pizza is baking, make the arugula salad. Blend the first 4 ingredients together in food processor or with an immersion blender. Toss with arugula and place on pizza when it comes out of the oven. Serve with fresh fruit. This pizza looks really good, Amy. The dough looks hard to do, especially since I don’t have a mixer. I’ll have to try it, and hopefully my husband will like the urugula salad on top. Not hard Debbie…just give it a try. So easy! I love all the pictures! So helpful, and pretty. Nice job on this classy blog! Also–a question. I have a pizza dough recipe that I’m not a huge fan of so I’ve been on the lookout for a better one–I’m excited to try yours! When you take those frozen discs out of the freezer, do you let them rise some more, or simply allow them to defrost? We do homemade pizza a few times a month so I like the idea of making a bunch of dough to have at the ready. Hey Kaci…so great to hear from you! Good question on the pizza dough. I found leaving it out on the counter (still wrapped in seran) for 4 hours or to bring it to room temp before you roll it out works well. I’m with youjit’s great to have it at the ready! well, I will have to try this..especially based on Ingrid’s ravings! Hey mom, we are making this recipe tonight. I like your blog by the way. See you soon. YUM! That sounds awesome. We’ll definitely have to try it. And I love your blog! We eat tons from the garden too. So far I only have the hang of growing a few things, but we eat them a ton. I’m totally taking notes from you. Thanks Bethany! it’s SO fun eating from the garden. Glad to have you aboard!